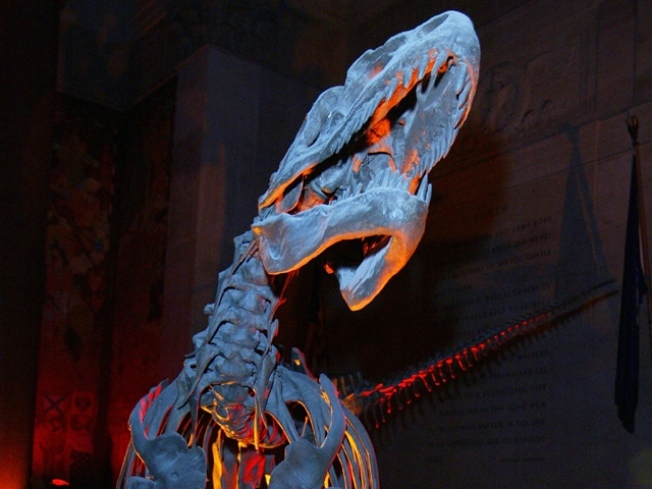 The 65-million-year-old T. rex at the American Museum of Natural History. Imagine it: Creeping through herds of taxidermied wild animals with only a flashlight to guide you, facing off against eerily silent wild buffalo and a 65-million-year-old T. rex in near-darkness, and drifting off under the 94-foot-long blue whale or the Alaskan brown bear. And no Ben Stiller anywhere in sight! The American Museum of Natural History is accepting reservations for the new season of its popular Sleepover at the Museum series, open to kids between the ages of 7 and 13 and their over-21 chaperones. Your $129 ticket price includes plenty of edutaining goodness, from a screening of "Dinosaurs Alive!" in the LeFrak IMAX Theater to a guided fossil exploration by flashlight (and general admission for the next day), plus all the amenities you’ll need for a comfy night in the museum halls: cots, evening snacks, and breakfast. Space is limited and these things always sell out fast, so get on it.